Any times shown are subject to change. Please check back frequently for updates or changes. Marketopia’s 4u2Grow Workshop - Get the Tools You Need to Reach Your Dreams, Guaranteed! Are you one of the 94% of MSPs struggling to grow revenue and profit? Prepare to be informed and inspired to grow by Terry Hedden, a recognized authority on growing technology companies. Terry transformed a $24,000 investment in to one of the largest and fastest growing MSPs in the world in just 6.5 years before selling to a strategic buyer. We’re so confident in our 4u2grow Workshop that if you don’t feel better prepared to achieve your goals, we’ll refund the full cost of your enrollment. When: September 5, 2018. Registration opens 30 minutes before workshop start time. Who Should Attend: IT service providers who are ready to break through to the next level of revenue and profits with the right sales and marketing techniques. Admission: $259 fee covers the workshop, snacks, all course materials, parking, plus entry in prize drawing. 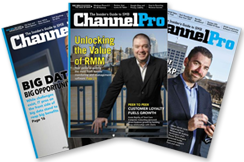 All paid workshop attendees on September 5th also receive a free pass to the ChannelPro SMB Forum on September 6th. SAVE BIG when you buy our all-access pass to all of the day's workshops. REGISTER NOW. Karl Palachuk’s SMB Roadshow Workshop is a three-hour workshop covering the essential business best practices and product portfolios needed to run and grow your successful IT managed services business. Who Should Attend: Any IT service provider who wants to stay up to date with the latest tools and techniques. Whether you make money on break/fix, managed services, or cloud services, this event will help you build a profitable business for years to come. In this 3-hour session, Steve Rutkovitz, a successful MSSP, will show you how to ethically steal business from your competitors by selling security-as-a-service and let certified security experts deliver the services for you. Will also advise you on how to protect yourself from all security service legal liabilities even if your client gets breached and how to easily sell the one thing that creates urgency in your prospect and leads to all other security sales. How to ethically steal business from your competitors by selling security-as-a-service and let certified security experts deliver the services for you. How to protect yourself from all security service legal liabilities even if your client gets breached. If you are an MSP who wants to sell more security services, this is for you. If you are selling cloud services, but want to know what security services customers are buying right now, this is for you. If you're not a security expert and are wondering if you have the technical competency to sell security services, then this is for you. If you're worried about increased legal liabilities of delivering security services, then this web class is for you. What results will you get from this class? You will know what security services you will be selling, how to package & price them. You will know how to fulfill these services to your customers. Book directly within the ChannelPro SMB Forum group room block by CLICKING HERE or dial (617) 969-1000 to make your reservations by phone. Be sure to reference the ChannelPro SMB Forum group when you make your reservation to receive the discounted room rate. Boston has a host of things to do and see while you're here to attend ChannelPro, click HERE to see a full list of options. 9:00am to 12:00pm Marketopia’s 4u2Grow Workshop - Get the Tools You Need to Reach Your Dreams, Guaranteed!